I'd like to hear more about that last flight (back in the day) and for sure the gliders of today are way safer. Hi Bill C. and others, thanks for the welcome. Yeah, my last flight in 1977 before my long hiatus was on a Manta Rogallo where I tried to launch from the big dune at Dillon Beach in a wind of 20+ mph, went straight up and flipped over backwards. Didn't go very high since it happened so fast, but I bent a few tubes. I didn't get hurt, except my pride! I'm flying a delta lite dream now, easy for me, although I certainly need more practice at landings, and perhaps I should go to Dockweiler beach one of these days, although it's no wind landings that I still have problems with. Bill McGinnis wrote: I'm flying a delta lite dream now, easy for me, although I certainly need more practice at landings, and perhaps I should go to Dockweiler beach one of these days, although it's no wind landings that I still have problems with. Dockweiler has a regular on-shore sea breeze during mid-day hours, but you can often get other conditions earlier and later in the day. Since my expulsion from USHPA, Dockweiler has become my most visited site. Several of us worked through the County of Los Angeles to get permission to fly there without USHPA membership. I particularly thank Joe Faust (USHGA #5), and Frank Colver (USHGA #7) for their help in obtaining that permission. We've been flying there almost every week since then. I sometimes skim the forum and don't read all the details of every post. I happened to re-read your introduction (below), and I'd sure like to read more. Can you elaborate on any of that background (maybe with some pictures thrown in)? Ground Slammer wrote: Hello from Ground Slammer. I've been in and out of hang gliding from the early 70's when I was a Kid. My instructor was----well nobody, and I've got the bamboo splinters under the skin to prove it. I pioneered a few sites, built and flew a few wings, got mentored by the likes of Chuck Slusarczyk and on building Ronny Richards. I now live in Humboldt CA and stopped flying last because it is too dangerous around here. I claim the unofficial record for hooking a thermal at the lowest altitude-bottom of the bunny hill with feet on ground-beat that! Right now I'm working on a project to see if I can make a modified Quicksilver sail-one that will allow me to homologate the Fledge II airfoil. The resultant glider is: Est L/D 14 to 1, ( AR 8), est sink under 120. The HG will be the core of a tow Ultralight Glider that I'll then attempt to make an electric self launch, self recovering motor glider. I was invited by Bob following a discussion about the HPAC in Canada. The HPAC is the USHPA equivalent but in less good and a bad BoD but still has regular insurance coverage. The HPAC expelled me in 2016 for completely fabricated reasons after I argued online with the president. This story is online somewhere in mt7.ca so no need to write more here. About me: I started hang gliding officially in 1984 in Québec, a year after I had my private pilot licence. I had the ultralight type check the year after. I did not pursue ultralight much and stopped aircraft flying because of the expense. In the 80s I ran the provincial association for a couple of years. It was mostly writing stories in the newsletter. I moved in Alberta in 1991 for university an discovered western Canada flying sites. Of them, the best was mount 7 in Golden and that is why I live here now. I went in California for a couple of weeks for studies in the 1990s and flew along the way. I did Sandy Beach I think it was called near Monterey, Wadell creek, Fort Funston. Nice flights in all these. I volunteered for the HPAC from 2000 to 2016 and worked for the HPAC in the webteam from 2005 if I recall correctly. I fly mostly hang glider, I started with a Gemini a couple of years, then a Sport 167 for over 20 years. I still fly a Sport 167. 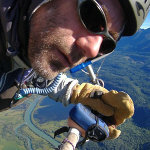 I got a taste of paragliding in 1988 but it was not good yet. I did buy a paraglider in 1999 and flew it about two years, where I got more accidents and scares than during the previous 20 years hang gliding. The paraglider ended up in the trees and could not retrieve it (no GPS at the time). I bought another paraglider last year for when the conditions are easy in the margin seasons. That paraglider proved more stable but I would avoid it in strong conditions. I think the US Hawks is a good idea. It is a bit too USA though to take in Canada much. Plus, no paragliding would limit it from growing also. But having it compete and challenge the USHPA is certainly a good thing. I like to fly distance and keep a log of that online in french. Your flying history is super. It is infuriating to me that anyone's flying should be limited for political reasons. That's a crime against the love of flight itself. As a Canadian, you present us with a bit of a challenge to define our place in the larger world of hang gliding. I believe Joe Faust is already seeing that larger world with his World Hang Gliding Association. Maybe you can help us organize the pieces of that larger puzzle? Welcome to the U.S. Hawks!!!! I'll go to your website soon but I'm packing for a HG trip 200 miles (Kilometers = ? ) North of Las Cruces, New Mexico (USA). I'm withholding my U$hPA dues ($150.00/yr) until they invite Bob K. back as a full member or at the very least until they specify the SOP he violated and use evidence to prove it. As things stand they threw the book at him but forgot to underline the SOP's involved. I'm Rol Klingberg. I have been a pilot for 45+ years and I have flown every type except jets. I'm also trained as an aero eng. I'm currently retired from the aerospace industry. You may have heard of me from long, long ago. I am the designer, builder, and pilot of the original Klingberg Wing foot launch sailplane. I'm also the former owner of Future Flight R/C models which included the 2 meter Klingberg Wing. Maybe some of you owned one as some point. I have been working on the current design (on and off) for about 10 years. I have spent a lot of time on the stall spin issues, dynamic stability, and weight reduction. The design is a flying wing of composite construction with a wing span of 15 meters (standard class sailplane). Wing area is 150 sq ft. It has flaps and elevons for control. The wing will have three panels on each side and a small center section. the longest panel is 12 feet. Control is via side stick with belt/gear/torque tube drive system. I have started construction of the prototype and the winglets are complete. You can follow all my activities for free on YouTube, and hope you subscribe and tell others. Full technical details of the design are/will be presented on my Patreon site for anyone who becomes a Patron. Those folks will also receive first access to everything I post and will have access to my upcoming podcasts. Anyone who becomes and stays a Patron for one year will have their name applied to the prototype aircraft so in a way they can say they "flew" with me on the first flight! I hope you will visit and give serious consideration to becoming a Patron. If the videos leave you "wanting" and you have questions for me, you can reach me via YouTube Comments or this web site. Thanks for reading, wish me luck/skill, and please fly safe! Welcome to the U.S. Hawks Rol!!!! That's an amazing resume and an awesome list of features/specifications. Wow!! I'm sure a lot of us will be following your work. Please contact me any time if you need help with anything on the forum.